Madanchi, H., Honari, H., Sadraeian, M., Hesaraki, M. (2011). Fusion of CtxB with StxB, Cloning and Expression of in Esherichia coli: A challenge for Improvement of Immune Response Against StxB. Iranian Journal of Pharmaceutical Sciences, 7(3), 185-190. Hamid Madanchi; Hossein Honari; Mohammad Sadraeian; Mahdi Hesaraki. "Fusion of CtxB with StxB, Cloning and Expression of in Esherichia coli: A challenge for Improvement of Immune Response Against StxB". 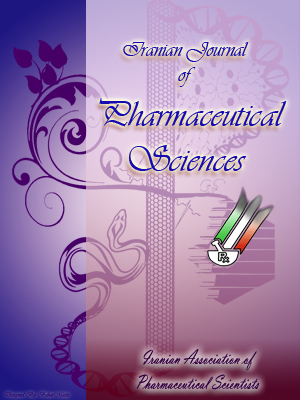 Iranian Journal of Pharmaceutical Sciences, 7, 3, 2011, 185-190. Madanchi, H., Honari, H., Sadraeian, M., Hesaraki, M. (2011). 'Fusion of CtxB with StxB, Cloning and Expression of in Esherichia coli: A challenge for Improvement of Immune Response Against StxB', Iranian Journal of Pharmaceutical Sciences, 7(3), pp. 185-190. Madanchi, H., Honari, H., Sadraeian, M., Hesaraki, M. Fusion of CtxB with StxB, Cloning and Expression of in Esherichia coli: A challenge for Improvement of Immune Response Against StxB. Iranian Journal of Pharmaceutical Sciences, 2011; 7(3): 185-190. Cholera toxin B subunit (CtxB) is a homopantameric, nontoxic subunit of cholera toxin that is responsible for its binding to the cell and has been known as a mucosal adjuvant for vaccines that could increase homoral and mocusal immunity response. In this work, the CtxB gene was fused to the StxB gene from Shigella dysenteriae type I a vaccine antigen candidate against this pathogen, by a nonfurin linker then ligated with pGEM vector and subcloned in the pET28a(+) as an expression vector . The CtxB-StxB fusion protein was expressed in Escherichia coli, and purified by a Ni-NTA resin column, then detected molecular weight and immunogenicity by SDS-PAGE and Western-blot. StxB has low molecular weight, so immune response against it is low, while CtxB is a potent mucosal adjuvant. In this method, the CtxB-StxB fusion protein was expressed in Escherichia coli in order to use its natural adjuvanticity of the CtxB which will enhance immune response against StxB, as well as, it will produce immune response against both shiga and cholera toxins. Vaccination against Shigella species for prevention of shigellosis presents a number of problems, and as a consequence, no efficient Shigella vaccine is available as yet . Shigellosis is a global human health problem. Four species of Shigella i.e. S. dysenteriae, S. flexneri, S.boydii and S. sonnei are able to cause the disease. Shigella dysenteriae type 1 produces severe disease and may be associated with life-threatening complications. Symptoms of shigellosis include diarrhea and/or dysentery with frequent bloody mucus stool, abdominal cramps and tenesmus . Shigella bacteria multiply within colonic epithelial cells, cause cell death and spread laterally to infect and kill adjacent epithelial cells, causing mucosal ulceration, inflammation and bleeding. Transmission usually occurs via contaminated food and water or through person-to-person contact. Laboratory diagnosis is made by culturing stool samples using selective/differential agar media . Shiga toxin is a main virulence factor in Shigella dysenteriae. This toxin is a hexameric protein with a molecular mass of 70.5 kDa, which is composed of an enzymatic subunit StxA monomer and a receptor- binding StxB homopentamer. Shiga toxin A subunit (stxA), mediates toxicity and B subunit (stxB) is a nontoxic homopentameric protein responsible for toxin binding and internalization into target cells by interacting with the glycolipid, (Gb3) . StxB has low molecular weight and composed of 69 amino acids, so immune response against it is very low. In addition, some works have reported the genetic fusions of CtxB with several antigens, such as epitopes from hepatitis C virus, foot-and-mouth disease virus and pneumococcal surface adhesin A (Psa A) . Both conjugation and genetic fusion to CtxB can elicit strong mucosal antibody responses to linked antigens [4, 5]. Cholera toxin B subunit (CtxB), the pentameric non-toxic portion of cholera toxin (CT), is responsible for binding to the GM1 ganglioside receptor, as a glycolipid. SDS-PAGE analysis showed CT consisted of a single large A subunit (CtxA) of approximately 27 kDa and a pentameric B subunit (CtxB) with an approximate monomer molecular weight (MW) of 10.6 kDa . The CtxA subunit was further shown to be divided into CtxA1 and CtxA2 subunits linked by a disulfide bond. CtxA1 subunit was found to be responsible for CT toxicity . The assembly of CT structure revealed that the toxic CtxA1 subunit contained ADP-ribosylating activity, while the helical CtxA2 fragment was found to be responsible for embedding CtxA1 subunit into the center of the doughnut shaped CtxB pentameric oligomer . The binding of CT via its CtxB subunits to GM1 permits toxin endocytosis through caveolin-coated and clathrin-coated vesicles. GM1 is constitutively expressed in most cells in the body, including leucocytes . Enhanced immunogenic and adjuvant properties of microbial holotoxin B subunits, such as CtxB and LTB, have been widely reported upon in a number of recent studies . Therefore, stimulation of homoral immune system which releases pathogen-specific secretory antibody, that can prevent both microbial toxins. In this study, a CtxB-StxB fusion protein was expressed in E. coli. Purified protein was used in our next studies such as an immunization and production of polyclonal antibody against both shiga and cholera toxins. Figure 1. The CtxB gene amplified from a plasmid contained CtB with restriction sites. Lane 1: 100 bp DNA size marker. (#SM0623 purchased from fermentas co.); Lane 2,3: CtxB amplified gene (372 bp). Pfu and taq DNA polymerase (2.5U/μl, Fermentas, Lithuania), Enzymes Sal I, HindIII and BamHI (Fermentas, Lithuania. ), IPTG (Vivantis, Malesia), Vector pET-28a(+) (Novagen USA), Vector pGEM-T (Promega, USA), CtxB gene of v.cholera was amplified from vector contain CtxB (Tehran university) by PCR. StxB gene was amplified from plasmid which had StxB Gene (Imam Houssein University ,Tehran, Iran) and used as the template in PCR experiment. E. coli DH5α and E. coli Rosetta (DE3) were used for cloning and expression experiments, respectively. Plasmid pGEM -T Vector and pET-28a(+) were used as cloning and expression vectors, respectively. The CtxB gene was amplified using pfu DNA polymerase. Then the PCR product was gel-purified using the DNA Extract kit (Sigma). Then the PCR product was trailed with dATP, ligated to pGEM vector, and transformed into E. coli DH α. Ampicillin selection and some control tests ensured the presence of the plasmid and to construct pGEM-ctB vector . Figure 3. PCR of recombinant pET-28a(+)-CtxB-StxB that transformed to Rosetta (DE3) Lane1,4,5,6: PCR positive clones(591bp); Lane2: 100bp DNA size marker (#SM0623 purchased from fermentas co.). Reverse primer (stxB):5′AAGCTTAT TATCAACGAAAAATAACTTC 3′ GGACCAGGACCA is gene codon of a nonfurin linker that is rich of glycine and proline amino acids. The StxB gene was amplified using pfu DNA polymerase. Then the PCR product was trailed with dATP, ligated to pGEM-CtxB vector that digested with BamHI and Hind III, that previously obtained, and transformed into E. coli DH5α . Therefore, we produce pGEM ctxB-Linker-stxB. Cloning was tested with control test such as PCR and endonuclease digestion. Figure 4. Expression of CtxB-StxB protein in pET-28a(+)-ctxB-stxB E.coli Rosetta (DE3) Lane 1: Protein size marker (cat No:# SM0431purchased from fermentas co.); Lane 2: A culture of Rosetta (DE3)without PET-28a(+); Lane 3: Negative control (Non-induced recombinant bacterial cells); Lane 4: 25.8 kDa protein resulted from crud extraction of bacterial cells. The CtxB-StxB fragment was produced with digestion pGEM ctxB-stxB by Sal I and Hind III restriction endonuclease and subcloned to indigested pET28a (+) as an expression vector and to construct pET28a(+)-CtxB-StxB. Then the recombinant plasmid pET-28a (+)-CtxB-StxB was confirmed by PCR and restriction enzyme digestion . This recombinant pET was amplified in competent E. coli DH5α, then extracted by alkaline lysis method  and save in -20oC. The resulting plasmid pET-28a(+)-CtxB-StxB was transformed into competent final host E.coli Rosetta (DE3) and was Cultured on LB medium containing kanamycine as a selection marker . A recombinant plasmid was prepared and identified by restriction enzymes. In order to sequence of inserted fragment, 20 μl of purified recombinant plasmid was sequenced by Kosar Bio-tech Company. The best clone was chosen for expression in a larger scale. The CtxB-linker-StxB expression system pET-28a (+)-ctxB-stxB Rosetta (DE3) was cultured in LB medium at 37°C. After the OD value (=600) of the bacterial culture reached 0.6, it was induced by isopropylthio-β-D-galactoside (IPTG) at final concentration of 1 mmol/l. Then precipitate and incubated in 37 °C for 6 h. The bacteria were collected by centrifugation and the cell pellet was broken by B Buffer (NaH2PO4:13/8 g, Tris-HCl:1/2 g, urea 480/5 g, add DDW to 1 liter, adjust pH at 8). The molecular weight of the CTB-STB fusion protein was identified by sodium dodecyl sulfate-polyacrylamide gel electrophoresis (SDS-PAGE). The CtxB-StxB fusion protein was recovered from the inclusion bodies. Cell lysates were centrifuged at 14000 rpm in 4 °C for 20 min. All proteins were expressed with a 6 His tag at N-terminus to facilitate the purification through Ni2+-charged column chromatography and purified by a Ni-NTA resin column, then detect molecular weight by SDS-PAGE. Immunoreactivity of the CtxB-StxB fusion protein was determined by Western blot. For Western blotting, proteins were transferred to nitrocellulose membrane and incubated with the rabbit antiserum against Histidine and HRP-labeling sheep anti-rabbit IgG as the first and second antibodies, respectively. Figure 5. Western blotting analysis of expressed recombinant protein, using an anti-Histidine antibody. Lane Control (C): Non-induced recombinant bacterial cells; Lane Test (T): Induced recombinant purified protein by nickel column; Lane Marker (M): Protein size marker (cat No:#SM0431 purchased from fermentas co.). The CtxB was amplified with restriction sites from a plasmid contained CtxB that is shown in Figure 1. The 372-bp expected fragment amplified by PCR contained SalI and BamHI, HindIII restriction sites. The 372-bp PCR product was cloned into pGEM-T vector at first step. The recombinant pGEM-ctxB vector was digested with BamHI and HindIII enzymes and StxB fragment (207-bp) with a glycine, proline linker was digested with BamHI and HindIII restriction enzyme, then amplified by PCR followed by ligation to give pGEM-ctxB-stxB vector (Figure 2). The pGEM-ctxB-stxB vector was digested with SalI and HindIII enzymes and ctxB-stxB fragment was ligated into the corresponding sites of pET-28a(+). The recombinant plasmids pET-28a (+)-ctxB-stxB were digested by Sal I and HindIII and analyzed on agarose gel electrophoresis (Figure 3). The recombinant pET-28a (+)-CtxB-StxB was transformed into E. coli Rosetta (DE3) strains and the fusion protein was expressed. The 1 mmol/l of IPTG was able to efficiently induce expression of CtxB-StxB fusion protein with a predicted molecular mass of 25.8 kDa (Figure 4). A culture of Rosetta (DE3) without PET-28a (+) and a culture of recombinant E. coli Rosetta (DE3) that wasn’t induced by IPTG used as a negative control. The concentration of recombinant protein after purification was measured by Bradford assay. This concentration was about 3.8 mg/ml. Expression of CtxB-StxB protein was investigated in E. coli. For this reason, an antibody against the Histidine tag was employed. Expression of recombinant protein was confirmed by appearing a proper band control (figure 5). Shigellosis, commonly known as acute bacillary dysentery, is manifested by the passage of loose stools mixed with blood and mucous and accompanied by fever, abdominal cramps and tenesmus . Shigellosis is caused by Shigella spp. which can be subdivided into four serogroups; S. sonnei, S. boydii, S. flexneri and S. dysenteriae. Shigella dysenteriae type 1 produces severe disease and may be associated with life-threatening complications. The morbidity and mortality due to shigellosis are especially high among children in developing countries [7, 8]. Currently, no vaccines against Shigella infection exist. Both live and subunit parenteral vaccine candidates are under development. Because immunity to Shigella is serotype-specific, the priority is to develop vaccine against S. dysenteriae type 1 and S.flexneri type 2a . Shiga toxin is the main virulence factor in Shigella dysenteriae type 1. Shiga toxin is a hexameric protein with a molecular mass of 70.5 kDa. It is composed of an enzymatic subunit StxA monomer and a receptor-binding StxB homopentamer [3, 9]. Subunit A (StxA), mediates toxicity, and B subunit (StxB), is a nontoxic protein responsible for toxin binding and internal-ization into target cells by interacting with the glycolipid (Gb3) . The StxB gene from Shigella dysenteriae type 1 is a vaccine antigen candidate against this pathogen . StxB has low molecular weight and composed of 69 amino acids, so immune response against it is low. Cholera toxin B subunit (CtxB) is the pentameric non-toxic portion of cholera toxin (Ctx), responsible for the holotoxin binding to the GM1ganglioside receptor, a glycolipid that is constitutively expressed in most cells in the body[3, 5, 10-13]. CtxB is also described as a potent mucosal adjuvant. Chemical conjugations with CtxB have been performed using many different heterologous antigens [5, 14-16]. Both conjugation and genetic fusion to CtxB can elicit strong mucosal antibody responses to the linked antigens. The binding of Ctx via its CtxB subunits to GM1 permits toxin endocytosis through caveolin-coated and clathrin-coated vesicles [5, 11]. Therefore, stimulation of homoral immune system which releases pathogen-specific secretory antibody can prevent both microbial toxins. In this study, a CtxB-StxB fusion protein was expressed in E. coli in order to use natural mucosal adjuvanticity of CtxB, which will enhance immune response against StxB, as well as immune response induction against both shiga and cholera toxins. Because of numerous rare codons in native genes of CtxB and StxB, expression of this recombinant protein was failed in our research, for this reason we used E.coli strain Rosetta (DE3) which had additional tRNA for translation of these rare codons . Harari I, Donohue-Rolfe A, Keusch G, Arnonl R. Synthetic peptides of Shiga toxin B subunit induce antibodies which neutralize its biological activity. Infect Immun 1988; 56: 1618-24. Niyogi SK. Shigellosis. J Microbiol 2005;133-43. Pina DG, Johannes L. Cholera and Shiga toxin B-subunits: thermodynamic and structural considerations for function and biomedical applications. Toxicon 2005; 45: 389-93. Arêas AP, Oliveira ML, Miyaji EN, Leite LC, Aires KA, Dias WO, Ho PL., Expression and characterization of cholera toxin B-pneumococcal surface adhesin A fusion protein in Escherichia coli: ability of CTB-PsaA to induce humoral immune response in mice. Biochem Biophys Res Commun 2004; 321: 192-6. Odumosu O, Nicholas D, Yano H, Langridge W. AB toxins: A paradigm switch from deadly to desirable. Toxins 2010; 2: 1612-45. Sambrook J, Fritsch EF, Maniatis T. Molecular cloning: A laboratory manual, 2nd ed. New York: Cold Spring Harbor Laboratory Press, 1989. Sur D, Ramamurthy T, Deen J, Bhattacharya SK. Shigellosis: challenges and management issues. Indian J Med Res 2004; 454-62. Schaetti C. Vaccines for enteric diseases: update on recent developments. Expert Rev Vaccines. 2009;8:1653-5. Zhu C, Yu J, Yang Z, Davis K, Rios H, Wang B, Glenn G, Boedeker EC. Protection against Shiga toxin-producing Escherichia coli infection by transcutaneous immunization with Shiga toxin subunit B. Clin Vaccine Immunol 2008; 15: 359-66. Zy H, Li MF, Zhang WJ, Wu XF. Cloning of the ctxB Gene of Vibrio cholerae and its expression in E. coli. Vaccine 2003; 32: 149-52. Holmgren J, Lonnroth I, Mansson J, Svennerholm L. Interaction of cholera toxin and membrane GM1 ganglioside of small intestine. Proc Natl Acad Sci 1975; 72: 2520-44. Sanchez J, Holmgren J. Cholera toxin structure, gene regulation and pathophysiological and immunological aspects. Cell Mol Life Sci 2008; 65: 1347-60. Zhang RG, Scott DL, Westbrook ML, Nance S, Spangler BD, Shipley GG, Westbroock EM. The three-dimensional crystal structure of cholera toxin. J Mol Biol 1995; 251: 563-73. Maddaloni M, Staats HF. Mucosal vaccine targeting improves onset of mucosal and systemic immunity to botulinum neurotoxin. J Immunol 2006; 177: 5524-32. Czerkinsky C, Sun JB, Lebens M, Li BL, Rask C, Lindblad M, Holmgren J. Cholera toxin B subunit as transmucosal carrier-delivery and immunomod-ulating system for induction of anti infectious and anti pathological immunity. Ann NY Acad Sci 1996; 778: 185-93. Mizuno D, Ide-Kurihara M. Modified pulmonary surfactant is a potent adjuvant that stimulates the mucosal IgA production in response to the Influenza virus antigen. J Immunol 2006; 176: 1122-30. Song H, Zhou L, Fang W, Li Y, Wang X, Fang H, Li X, Wu M, Qiu B. High-level expression of codon optimized foot-andmouth disease virus complex epitopes and cholera toxin B subunit chimera in Hansenula polymorpha. Biochem Biophys Res Commun 2004; 235-9.